Circular flower petal shaped egg noodle pasta filled with a flavorful filling. 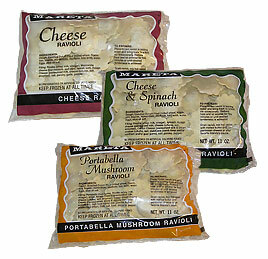 We offer our ravioli with cheese, cheese & spinach or portabella mushroom. Place in boiling water, bring back to a boil, reduce heat and simmer for 5 minutes or until desired tenderness. Serve with any of the Mareta sauces or cover with melted butter and sprinkle grated cheese on top and serve. Egg noodle pasta folded around meat or cheese filling and twisted into a ring. Our tortellini is available with beef, cheese, tri-colored cheese or spinach & cheese. Place product in boiling water, bring back to a boil, reduce heat and simmer 8 minutes or until desired tenderness. Then drain water and serve with your favorite Mareta’s sauce. Beef Tortellini - boil in chicken broth and serve as a soup (be sure to use plenty of broth, this will prevent a starchy broth), pieces of chicken and vegetables can be added if desired. Cheese Tortellini - can be used in pasta salads, soups with a vegetable medley, with warmed butter and rubbed sage. Spinach and Cheese Tortellini - great with any kind of alfredo or cream sauces, cold pasta salads, and soups. Tri-Colored Cheese Tortellini - made for pasta salads or for a colorful hot dish. Flour, potato, and cheese dumpling resembling a football shape. Serve in a cream, meat, or marinara sauce. 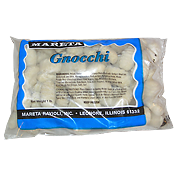 Gnocchi is an Italian style dumpling, so it can be used in recipes that call for dumplings. Thaw out overnight in the refrigerator, or thaw and heat in the microwave or on the stove. 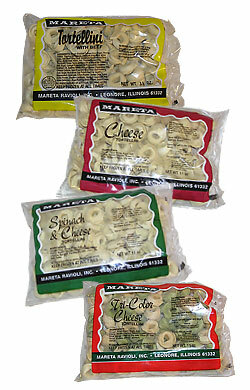 Place on any of the Mareta’s pastas, spaghetti, meatballs, lasagna, or a tomato base for any type of cooking.